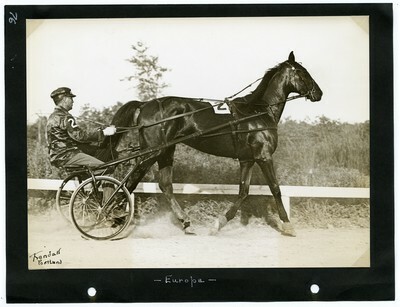 Black and white photograph of bay filly, Europa wearing saddle number two, F. Egan up for The National Stake Two Year Olds Trotting One Mile. The race took place at the Old Orchard Beach Kite Track on Tuesday, July 28, 1936. The photograph is signed in the lower left corner by photographer Guy Kendall.